Gathering in the spirit of Blessed Edmund Rice. The SERV concept began to take shape during the 31st Christian Brothers Congregation Chapter held in Nairobi in March 2014. Through informal discussion and interaction with delegates from the Edmund Rice Global Network who were in attendance I learned about Edmund Rice societies, groups and initiatives in various schools in South Africa, North and South America and Australia. Their aim was to encourage students to engage and interact with each other and find expression of the spirit and charism of Edmund Rice in diverse and imaginative ways. I felt the possibility of establishing such a group or society in Midleton CBS would be worth exploring also. While many Midleton CBS students had engaged in various Edmund Rice related activities, projects and fundraisers while in the school they had not previously had an opportunity to gather and engage with fellow students to share and reflect on these experiences in an intentional,purposeful manner. I felt that such a gathering might provide a springboard to give further expression to and enhance the efficacy of the Edmund Rice charism and spirit within our school community. Having discussed the concept with some colleagues an invitation was issued to all post- Junior Cert students who had previously engaged in a range of activities and experiences including our India Immersion programme, Lourdes Youth Helpers Group, Meitheal Group, Edmund Rice Camps and the Edmund Rice Outreach Project – a “Challenge” which is offered to students in Transition Year. On Thursday, September 18th 2014, a group of 20 students and 3 Teachers gathered voluntarily during lunch-break in the Blessed Edmund Rice Pastoral Centre (formerly the Christian Brothers Monastery) adjacent to Midleton CBS, for the first meeting of what has since become known as SERV – a name which the students adopted at a subsequent meeting. Having spent some time in reflection followed by discussion and listening to personal testimonies on “the Edmund effect “, the characteristic principles of the Edmund Rice Network which “encompasses all those (groups and individuals) who identify with, share in or are in intentional relationship with the charism of Blessed Edmund Rice” (Munnar Chapter 2008) were adopted by the group. These include Spiritual Search, Compassionate Action and the formation of Authentic Community. Some school-based compassionate action projects were identified and the gathering concluded in the positive hope that an authentic expression of intentional commitment to the message of the Gospel through the example of Edmund Rice and his followers would begin to flourish in our school. SERV encourages students to explore ways they can continue to be of service to others thereby giving practical expression to what Jesus said and Edmund set about doing during their time on earth. The Gospel of Mark (10:45) states: “for even the son of man did not come to be served but to serve, and give his life as a ransom for many”. In the Edmund Rice Prayer we say the words “grant us the courage and compassion of Edmund as we seek to live lives of love and service” (showing love and helping others). This is what we find Edmund Rice people doing across the globe. Some have given a lifetime commitment to these principles as Brothers. SERV members through their commitment to follow in the footsteps of Edmund in effect become “Companions” of the Brothers and of the thousands of volunteers within the Edmund Rice Global Network. Committed people who wish to travel on the journey and in the direction the Brothers have decided to take in “A Way into the Future”– with and among the poor of the world. 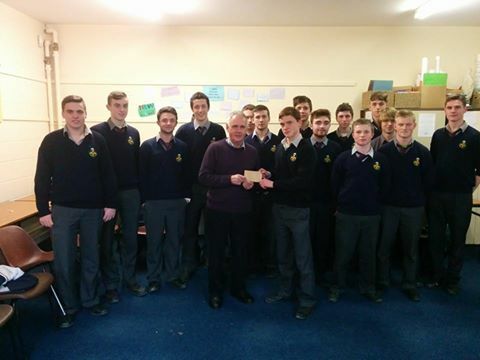 Examples of compassionate action and Christian outreach undertaken by the Midleton CBS SERV group to date include; running the school charity tuc shop during lunch breaks, organising the ERD West African Ebola Appeal and €3,500 school donation, the St. Vincent de Paul Christmas Food Appeal and €1,000 donation and a €1,000 donation to the My Place Midleton Youth Cafe construction fund . Currently, SERV members are planning a positive mental health week for the school which they hope to run in March in conjunction with an awareness campaign relating to World Day for Women. It is also hoped that SERV will have a role in Edmund Rice Week celebrations in May including a combined Edmund Rice Network event to be held at a venue in Cork celebrating the legacy and value of Edmund Rice education throughout the city and county. 2,000 years ago, Christ began his life on earth in a stable. In 1802, Edmund Rice began to personally encounter Christ with the poor in a Waterford stable. Pope Francis challenges us to a renewed personal encounter with Christ or as he puts it “at least to be open to letting him encounter us”. SERV invites students to become receptive to the challenge that Pope Francis sets before us; to become responsive to the potential of the gift that their service can offer to the people and to the places they inhabit each day no matter how small or insignificant it might appear to be. Pope Francis continually draws the attention of the world to the needs of the poor. Edmund Rice did likewise in his day “give to the poor in handfuls” is how he encouraged his brothers to act. SERV encourages students to be open to becoming a Companion of Jesus, of Edmund and of other like-minded people inspired by the message of the Gospel to do their bit together to change things for the better whenever they can. Student Edmund Rice Volunteers – “Together we can make a difference”. Congratulations to all at CBS Midleton for this wonderful initiative and for your fantastic support of the Edmund Rice missions this year and in the past. Your commitment and hard work is very inspiring. We look forward to the spread of the SERV initiative across the network in the near future – and of course to meeting the guys out west for the charity cycle in April! We’re already in training here!! With you all the way SERV and Paul. God bless your great work. Well done Martin. Looking forward to continuing to be on your Distribution List. Congratulations to all involved in this initiative. It’s great that this is a bottom up initiative rather than a top down one. That is it’s best hope of success. Thanks for sharing the good news with the rest of us. I’m sure others will get inspiration from hearing about it. At a meeting about Advocacy held in Mount Sion last week, schools were looking out for ideas that they could use. This was especially true in schools where there hasn’t been as strong a tradition of involvement in the Edmund Rice Network as is the case in Middleton CBS. Well done.